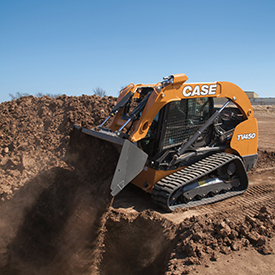 The CASE TV450 is an all-new 10,610-lbs. vertical-lift machine with a rated operating capacity of 4,500 lbs. The newest and largest CASE CTL ever built features an industry-leading 9,188 lbs. of breakout force, and optional high-flow (3,450 psi at 39.5 gpm) and enhanced high-flow (4,000 psi at 35 gpm) hydraulics for high-power attachments. CASE has also made a number of premium features standard on the new CASE TV450, including heavy-duty front and side lights, front cylinder guards, a heavy-duty rear door, remote oil and fuel filters, as well as debris ingression sealing to prevent material from entering the engine compartment.